Do you have a baseball field on your property that needs a new fencing system? Are you wondering what type of fencing options you might have when building a new baseball field? Although the most common baseball field fence you’ll see is likely a chain link baseball fence, that’s not the only type of fencing you can use to keep your baseball field properly outlined and secured. Want to learn more about your fencing options? Take a look below at the types of fencing materials we install at Twin Cities Fence and what types of fencing we recommend for baseball fields. At our Minnesota fencing company, we make sure that our customers understand all of their fencing options and needs and have options available to them that they might not find elsewhere. Coupled with our great service, and you can’t go wrong when you choose to work with us! Do you have an indoor baseball field that needs a fencing system? Or maybe you have a more typical outdoor baseball field that you’re looking to fence in. Whatever the case, at Twin Cities Fence, we install both outdoor and indoor baseball field fences using all kinds of fencing materials. Perhaps you’re operating an indoor sporting facility that includes an indoor baseball field, or have a single indoor baseball field, or maybe you have an entire indoor baseball park that you’re looking to keep organized and secure with fencing systems. Anything you need, ask and you’ll receive! Trying to decide which type of baseball field fencing material you want to or should use for your field? The best type of fencing material will depend on whether you have an indoor or outdoor baseball field, what your fencing budget is, how many baseball fields you need fencing for, how secure you want your fields to be, how durable your baseball fencing must be, and more. Check out the different types of fencing we offer below, and let us know if you have questions about which fencing material is best for you! Wood Fences: Our wood fencing systems include wood post and rail fences, or split rail fencing, wood privacy fences, steel post wooden fences, and picket fences. 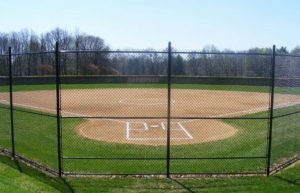 While not all of these fencing systems are right for a baseball field, you might consider using a combination of split rail wood fencing and privacy fencing for outdoor fields. Vinyl Fences: Similar to wood fencing, we install vinyl privacy fencing, vinyl post and rail fences, and vinyl picket fences. Vinyl fencing is typically used outside and offers goof weather-resistance. Perhaps you could use a vinyl post and rail fence for your baseball field! Chain Link Fencing: This is likely the most common baseball field fencing material you see, surrounding many large and small baseball fields on municipal and commercial properties. When installing a chain link fence, you’ll have the choice between the typical, gray galvanized steel chain link fencing and our colored, PVC coated chain link fences, which can be installed in several colors and offer increased durability. Both chain link fencing types are perfect for indoor or outdoor baseball field fencing, offering simplicity, safety, and security to your field. Aluminum Fences: An ornamental fencing system, aluminum fences can be used to make a baseball field more decorative and secure both inside and outside. It also adds a great modern feel to your field! Steel Fencing: Just like our ornamental aluminum fencing, but made of steel! Trex Fencing: Trex fencing is an eco-friendly, “green” fencing system that can be a great alternative to vinyl and wood fencing, as Trex fencing is durable, low-maintenance, and weather-resistant. You can choose from Saddle, Winchester Grey, and Woodland Brown color options to make your fence stand out! Whether you’re on the search for a residential, municipal, or commercial sports fencing company in MN, Twin Cities Fence will be sure to offer you everything you could need and want in a baseball field fencing company and more. Call us today at 612-443-1948, and we’ll help you choose the best baseball field fencing materials for your property!